Robyn Heras has been present at each of the NAISDA Cultural Residencies that have taken place at Nyinyikay since 2008. Nyinyikay is the homeland of Nancy Burarrwanga and her family. It is situated on the superb Arnhem Bay in East Arnhem Land. Nancy is a Dilak and Senior Elder of the Gumatj Burarrwanga clan. Dilak is a title given to a Yolngu Elder with the highest level of cultural knowledge. Nancy is also the creator of the magnificent Djilingirr woven mat of which NAISDA has now become the custodian. Robyn emphasises that at each of these residencies, Developing Artists have had the opportunity to see how Nancy’s family at Nyinyikay are, in the words of her grandson and senior tutor Marcus Lacey “like the sacred Gulminya tree – standing strong in one mind and one spirit”. Led by Nancy, daughter Megan, Marcus and other family members, the Developing Artists have had the experience of sharing in the knowledge that is embedded in that country where the family’s strength and wisdom have come from. And they have had the privilege of dancing with the family on the country where the songs and dances were created. They have learnt about the Warramirri land on which Nyinyikay is situated and the story of Madinga, the wild dog and ancestral being of Nyinyikay. 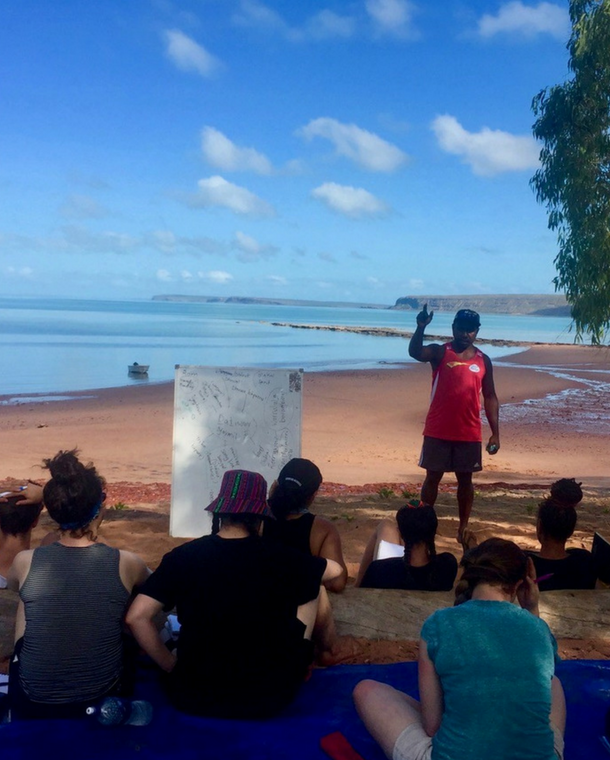 Led by Marcus, they have learnt about Yolngu kinship and how this is connected to the land and the responsibilities that family members carry as a result of this. They have been instructed in the ceremonial dances of the Datiwuy clan accompanied by senior ceremonial songmen and yidaki players. The Yolngu women and men have taken great pride in teaching both the female and male DAs to refine both the technical and spiritual elements of the ‘bunggul’ in preparation for the closing ceremony. 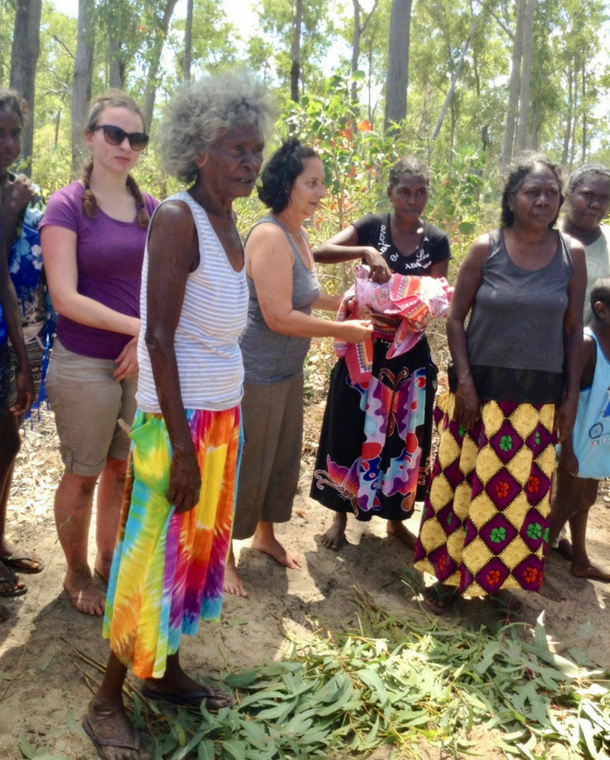 The female DAs have learnt how pandanus is collected, stripped down into fibres and dyed with natural dyes made from different coloured roots. Led by the ladies of the family, they have then woven the pandanus fibres into a series of creative works including baskets and jewellery. Under the skilful eyes of the Yolngu men, the male DAs have walked through the bush, learning how to recognise the trees, hollowed out by termites, that will be ideal for making a yidaki. They have then learnt how to cut down these trees, strip them of their bark, sand them down, place beeswax on the mouthpiece and prepare them for work as a yidaki. 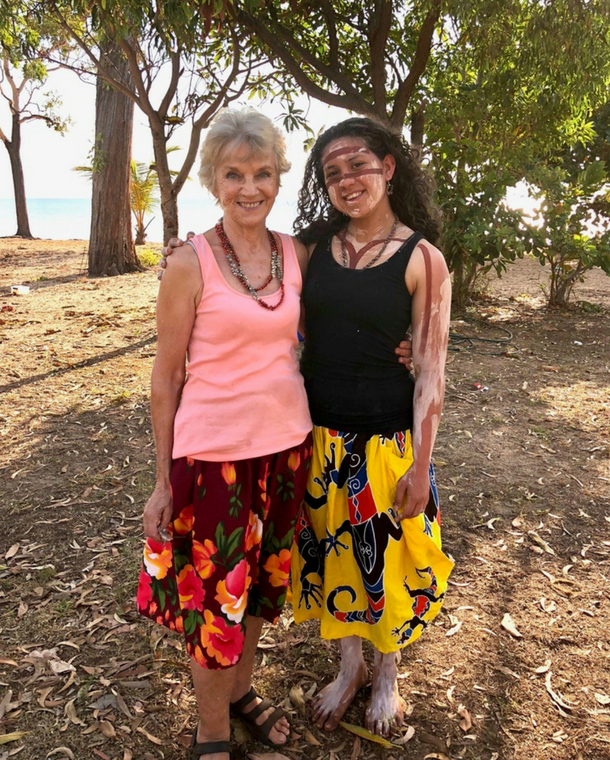 The highlight of the Cutural Residency has been the final bunggul dance ceremony where the Developing Artists dance with up to 4 generations of the Yolngu family – from the Elders to the youngest members of the family. Over the past 10 years, Nancy and family members of the Dätiwuy and Burarrwanga Gumatj clans have welcomed NAISDA’s Developing Artists on to their homelands. They have appreciated and acknowledged the respect of NAISDA to their Yolngu culture and the thirst for learning more about the deeper elements of their culture and of their songs and dances from the country on which they were created. The enthusiasm that comes from this sharing of culture has also been an inspiration to the younger members of the Yolngu family. The value given to the songs and dances by NAISDA’s Developing Artists has generated great enthusiasm for the participation of the younger members in activities with the Developing Artists, especially in the bunggul events. All of this has meant that NAISDA’s Cultural Residency has been a highlight over these years not only for NAISDA, but also for Nancy and the family at Nyinyikay. Marcus teaching NAISDA Developing Artists about country and kinship – a beautiful classroom!